Rats are cunning and cautious… therefore trap wary. Curiosity will always kill a rat as they will always return to a known food source to get at the food eventually. Rats will take 1-7 days before entering a new trap. Often it pays to leave the trap baited but NOT set for a few days to familiarise and attract rats to the trap. Once you set it… BINGO! Try sprinkling dust around trap to pick up paw tracks and detect rat presence…once you know they are there, it is just a question of patience!. Wash the trap and then wear gloves when handling it as this will eliminate human scent and reduce trap shyness. Rub bait onto the trap tunnel to increase bait scent and reduce rat shyness. A rats nerve reaction may cause it to travel up to 2 metres from the trap once ‘noosed’. Set the trap along the side of a wall or beside a large object… rats will avoid open spaces. Use the tunnel floor to scoop up the rat and dispose of it. We recommend using our specially formulated and proven ‘NOOSKI’ rat bait. Cheese, chocolate, peanut butter and bacon are also effective and readily available baits. ‘Nooski’ traps are fully weather proof and resistant to salt water. They are easy to wash and rinse as required. Rats will often live in pairs (male and female). We therefore recommend setting two or more traps in the same area as they will often hunt food together. Rats are known to carry up to 70 diseases including: Leptospirosis, rat bite fever, bubonic plague. Please be sure to wash your hands after rat trapping and also rinse traps before storing. Because ‘NOOSKI’ does not HOLD rodents it is proven to be the cleanest trap system available. 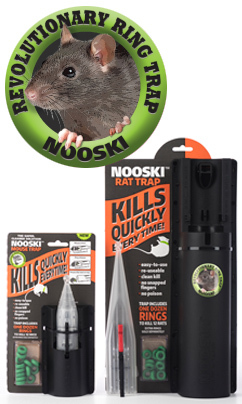 ‘NOOSKI’ is the ONLY ‘class A’ independently certified rodent trap on the market. Independent trialling has proven NOOSKI to be the safest, cleanest and most effective rodent trap system available on the market. Caution! Although safer than snap traps and poison, Nooski is still a lethal device. Our advice is to set out of reach of pets.